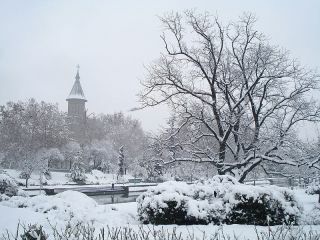 January snow along the Bega canal in the city of Timisoara, western Romania. Romanian police have arrested a man believed to be TinKode, the notorious hacker responsible for several daring, high-profile cyberattacks, including last year's breach of NASA's servers. Razvan Manole Cernaianu, 20, from Timisoara, is accused of breaking into the websites of the Pentagon and other U.S. government agencies, and posting information stolen from the sites to his personal blog, the Romanian Directorate for Investigating Organized Crime and Terrorist (DIICOT) said in a press release. TinKode also famously hacked into the websites of the British Royal Navy, the European Space Agency and MySQL, the latter of which he compromised by, ironically, exploiting an SQL injection flaw. Along with his network intrusions, police said Cernaianu, reportedly an IT student, designed a hacking program, which he put up for sale on his blog, and posted a video on the blog showing the cyberattacks he carried out against official U.S. government sites. This story was provided by SecurityNewsDaily, a sister siste of SPACE.com. You can follow SecurityNewsDaily on Twitter @Security_SND and on Facebook.